Portfolium is a social portfolio network that connects young, eager talent with opportunity. By combining features of professional networking platforms with the ability to create and aggregate multimedia content, Portfolium attempts to provide a deeper view of a student’s passions, abilities and potential. The company has signed deals with a number of universities, including the University of California system, to offer the service to graduating seniors. Times of San Diego spoke with Royce Rowan, chief marketing officer, about the company’s beginnings and strategy. My childhood friend, Adam Markowitz, founded Portfolium after grad school and showed it to me right after he launched the prototype. The concept immediately struck a chord with me, based on my own experiences transitioning from college to a career in marketing. Adam is a creative engineer with a relentless work ethic, and before he even finished pitching the long term vision he had for the product and company, I knew I had to be a part of it. Starting a company is incredibly difficult — there’s lots of adversity, long days and sleepless nights, all with the knowledge of the fact that most startups fail. This makes it very important to know why you’re doing what you’re doing. I wake up every day excited to get to work because I know that I am helping build a product and business that’s making a positive impact on people’s lives. Is this the resume of the future for graduating college seniors? We think the future is already here and that it’s been here. Technology and social media brought us into the future before some long-standing, cultural traditions like resumes had a chance to catch up. Portfolium isn’t necessarily replacing the traditional resume, but it’s definitely enhancing it. It’s bringing the resume and job recruitment process up to speed with today’s technology, by blending the “concept” of a resume with a compelling, media-rich, visual dossier of a student or recent grad’s academic work and projects. You have some blue chip employers using the product, including Boeing, SpaceX and Qualcomm. How does it help employers? The same frustration students and recent grads endure in creating a resume or LinkedIn profile applies to the very employers trying to recruit them. The only difference is their frustration costs their company time, and ultimately money. Finding the right student or recent grad to fill a position at a company can be very difficult, especially when relying solely on traditional methods, such as resumes and applicant tracking systems. Regardless of industry, employers hiring recent grads are looking for similar things: passion, skill and longevity — each of which is difficult to gauge in a resume and 30-minute interview. Portfolium provides employers with a much deeper, more all-encompassing view of a student’s passions, abilities and potential. This includes an important aspect in making hiring decisions: cultural fit. Many employers say good jobs go unfilled because qualified applicants aren’t available. Can Portfolium help this problem? If an employer is relying solely on the student’s resume to determine quality, then they are in a sense measuring that student’s ability to write a “good resume.” Unless they are hiring for a position where the main job function is to write resumes, then they’re missing some very crucial information about a candidate’s qualifications for the job. Every job has prerequisites. Every job also has specific skills and skill levels that would be a bonus. A one-line description on a resume or an “endorsement” from their closest friends on LinkedIn shouldn’t be what makes one applicant appear more “qualified” than the next. 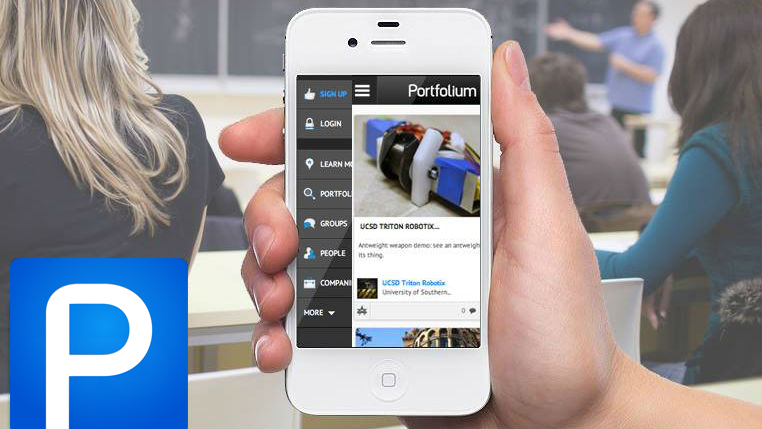 Portfolium allows any applicant to prove their skills and skill level by showcasing what they are capable of and what they’ve actually done. This is powerful, tangible evidence for determining if an applicant is qualified. You’re very involved in the local startup scene. How are you helping other startups? 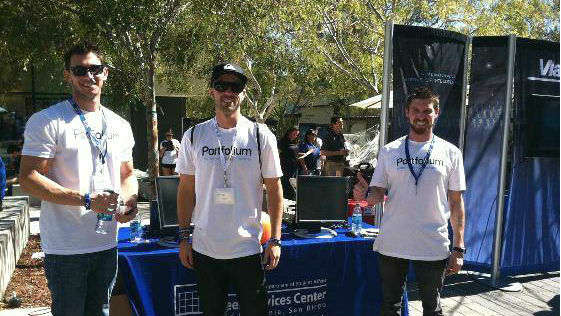 We’ve had such a great experience so far in the local San Diego startup scene. Since being accepted into EvoNexus last year, we’ve received an amazing amount of support and guidance, which has really helped us get to where we are today. We quickly learned the value of being involved in the all of the various events and activities put on by EvoNexus, as well as other startup organizations in town. Meeting and networking with other founders and mentors has allowed us to learn so much, so fast! We’ve met some incredible people and have been fortunate enough to help other entrepreneurs as well. It’s really exciting to see the local startup scene come to life and thrive — we’re committed to helping it continue to grow. San Diego is an amazing place to live, work and start a new business!